It's February and I've started seeing hearts everywhere. Call me a mush, but I like hearts. I like what they remind me of: Kindness. Love. Waterfalls of gratitude. 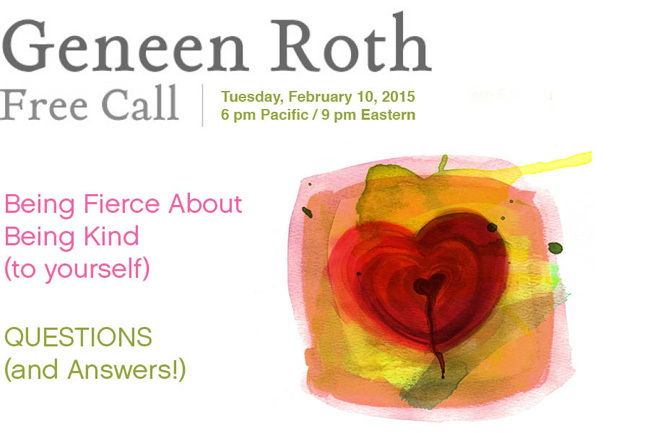 So on Tuesday, Feb. 10th, I answered your questions LIVE on a free call. Questions about being kind to your body means. What being kind to yourself means. And what food has to do with anything (or everything). It was fabulous -- as it always is when you get a group together about the issues that matter. This streaming audio will be available through Monday, Feb. 16th. Feel free to share it with your friends and family members, or whomever you’d like to invite into our circle. We’re sending you a copy. Check your email!